First of all, I must apologize for going MIA. I have been dealing, in the past couple of weeks, with some serious emotional stuff – and I ain’t talking about grief counseling stuff. I’ve had some serious life changes happen the past few weeks and its taken me a bit to get my blog legs under me again. Even as I try to write this, it feels…weird. I’m sure I’ll be back on the horse here in the next few days. I have a gripping exploratory of food-on-sticks up my sleeve that I will hopefully get to work on this weekend! I have been on a serious Mediterranean food bender lately. In the past couple of months, I’ve experienced some awesome off the beaten path places, all of whom seemed to make exceptional tabbouleh. I’ve made a twist on this salad before – in the waaay back stages of this blog – and it’s still a good option. Maybe I’ve become more of a purist or a traditionalist, but nothing is better than the parsley and lemon and garlic mixed with the simple bulgur. While I like eating it right when its freshly made, I think letting it sit overnight really lets all of the flavors mingle and get to know each other and really *shine*. A big scoop of this alongside some hummus and pita bread has become by comfort food meal-of-choice the past week or so. – Combine bulgur and boiling water in a large bowl. Cover, and set aside to soak for 1 hour. – Add oil, lemon juice, onions, parsley, mint, tomatoes, and cucumber; toss to combine. Season to taste with salt and black pepper. Cover, and refrigerate for at least 1 hour. I’ve been obsessed with tabbouleh as well! his past week I’ve literally gone Greek in all my meals. I hope you are feeling better on emotional front. Times can be tough so I’m sending good vibes your way! 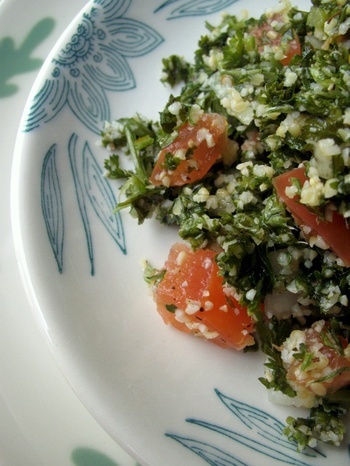 What is a Greek night without Tabbouleh? (we have Greek night at least every month). I like your version, and am with you through the tough times. Hope everyhting gets better.This is my favorite salad. And like you I think the flavors get better overnight. are the off the beaten path places in Atlanta? i’d love to know! a friend of mine told me about some Greek place on the edge of cabbagetown, but i can’t for the life of me remember the name of it. apparently it doesnt look like much from the outside, but the food is outstanding. Love that tabbouleh. Beautiful pic as always Young Tweezy. I like to use my tabbouleh on top of my lamb kebab. Mix it up with the leben, lamb, hummus, or whatever you have in your pita. Great stuff. Love tabbouleh!!! Yours looks delicious. Glad to have you back! Take your time. And, if you need a foodie break, I am right down the road! :) Literally! I’ve been eyeing the bulgar at the shop lately… I believe this has convinced me to buy it. Amazingly, I have never made tabbouleh… shame on me! I’m sending you well wishes Tami. I think this sounds like a great way to comfort yourself, delicious. odd, we both made very similar versions of Tabbouleh within a few days of each other. Somethings in the air…oh, wait, that’s called pollen. I have alwyas been interested in Tabbouleh, but afraid to cook it! I will try this, thanks!